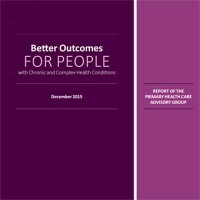 Sydney North Health Network recently welcomed the release of the Primary Health Care Advisory Group (PHCAG) Report: Better Outcomes for people with Chronic and Complex Health Conditions. A key recommendation of this report was a proposed model of care, supported by a new way of funding, for Australians with chronic and complex conditions. The model of care, known as the Health Care Homes, provides continuity of care, coordinated services and a team based approach according to the needs and wishes of the patient. It is this new approach, says the Chair of PHCAG, Dr Steve Hambleton and with the support of new payment mechanisms, that will improve patient outcomes. In the Sydney north region, research suggests that already 46 per cent of adults have a chronic health condition (source: National Health Performance Authority) and by 2025, and with an ageing population, it is estimated an additional 17,000 people, in the region, will be likely to have 3 or more chronic conditions. Sydney North Health Network is collaborating with GPs, stakeholders and partners to respond to the needs of patients with chronic and complex disease in our region and is currently refining a model with synergies to the Health Care Home model. “Such a model has the potential to enhance team-based care for patients with chronic disease and complex conditions and allow them to enjoy better health outcomes and a better experience in their interactions with the health system,” said Ms Stanton. The Person Centred Medical Home is a component of SNHN’s three year strategic plan to build primary health care capacity and improve patient outcomes for at risk groups. CLICK HERE for the Primary Health Care Advisory Group Report. CLICK HERE for SNHN’s media statement. CLICK HERE for SNHN’s strategic plan.